Can Your Child Be Experiencing Foot Pain?? Bump on the Side of Your Big Toe??????? Crossover toe is a common foot problem that can inhibit physical activity for older Americans, but out-patient surgery can correct the deformity and keep senior citizens active and on their feet. Individuals with hammertoes, bunions or a second toe that extends beyond the big toe are most susceptible to developing crossover toe as they age. It’s a common problem among older people in which the second toe gradually moves across the big toe. It can be painful and, therefore, difficult to walk comfortably or pursue an active lifestyle. The first symptom of crossover toe is pain in the ball of the foot. A tear in the joint makes the second toe unstable. It falls out of alignment and eventually drifts. Doctors normally check the ball of the foot for a possible plantar-plate tear when an older patient complains of pain in the area. Pre-existing forefoot problems combined with normal wear and tear or possible trauma can cause the plate to tear over time. If the pain persists and the toe starts to drift, surgery is recommended to suture the plantar plate or replace it through a tendon-transfer. Surgery to correct crossover toe is an outpatient procedure performed with a local anesthesia. Patients with bunions or hammertoes are advised to have those deformities corrected during the surgery. Recovery time is about six weeks. If you're an older adult with persistent pain in the ball of your foot, it's in your best interest to see a doctor, therefore give our office a call to set-up a consultation. Is your child tripping frequently, lagging behind their friends while playing or completely withdrawing from activities, if so your child might be suffering from a foot or ankle ailment. Foot and ankle problems in children often go unnoticed. Signs and symptoms can be subtle, and sometimes children can’t explain what’s wrong. But it’s important to protect growing feet and have problems checked out early. If your child lags behind in sports or play, it may be because their feet or legs are tired. Fatigue is common when children have flat feet: The muscles in the feet and legs tire easily because the feet are not functioning as well as they should. If your child is reluctant to participate, it may be due to heel pain: A problem often seen in children between the ages of 8 and 14. Repetitive stress from sports may cause muscle strain and inflammation of the growth plate, a weak area at the back of a child’s heel. Children may feel pain or notice a change in the appearance of their feet or nails but don’t want to tell mom or dad because they fear a trip to the doctor’s office. Therefore, make it a habit to inspect your child’s feet for any changes such as calluses, growths, skin discoloration or redness and swelling around the toenails. Repeated clumsiness may be a sign of in-toeing, balance problems or neuromuscular conditions, that may warrant a trip the doctor's office. It is never normal for a child to have foot pain. A child with any of these signs or symptoms should be promptly examined. Please call 1 of our offices for proper diagnosis and treatment of your child’s aliments. Tailor’s bunion is most frequently caused by an inherited faulty mechanical structure of the foot resulting in the fifth metatarsal bone starting to protrude outward, while the little toe moves inward creating a bump on the outside of the foot that becomes irritated with shoe gear. 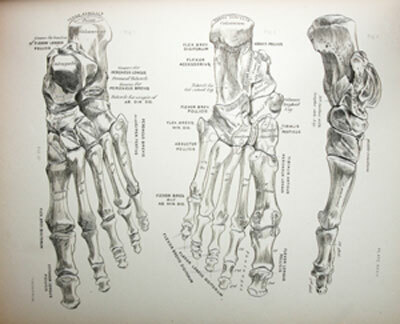 Another cause for a tailor's bunion is a bony spur (an outgrowth of bone) on the side of the fifth metatarsal head. Symptoms associated with a tailor’s bunions can include redness, swelling, and pain to the site of the enlargement. These symptoms tend to worsen with shoes that rub against the enlargement, irritating the soft tissues underneath the skin and producing inflammation. Shoes with a wide toe box. Avoid shoes with pointed toes or high heels. Pads placed over the area may help reduce pain. Non-steroidal anti-inflammatory drugs (NSAIDs), such as ibuprofen, may help relieve the pain and inflammation. Injections of corticosteroid may be used to treat the inflamed tissue around the joint. Surgery is often considered when pain continues despite the above approaches. Surgery can include many different procedures or combination of procedures based upon x-ray findings, age and activity level. If you or someone you know is suffering from a tailor's bunion, please do not hesitate to give our office a call for further information or to set-up a consultation, we are here to help! Most common symptoms, which may occur at the site of a bunion, include pain or soreness, inflammation and/or redness, burning sensation or possible numbness. Symptoms most often occur when wearing shoes that crowd the toes, such as shoes with a tight toe box or high heels. This may explain why women are more likely to have symptoms than men. Early treatment for bunion treatment is aimed at easing the pain, not reversing the deformity itself. These treatment options include a change in shoe gear: Wearing shoes that have a wider toe box and forgoing those with pointed toes or high heels, which may only aggravate the condition. Padding over the area of the bunion can help minimize the pain associated with bunions. Medications, such as oral non-steroidal anti-inflammatory drugs (NSAIDs), such as ibuprofen and icing several times a day can help to reduce pain and inflammation associated with the deformity. In some cases, custom orthotic devices may be provided to help reduce pain, control the abnormal biomechanics of your foot and prevent further progression of the deformity.If non-surgical treatments fail to relieve bunion pain and the pain of a bunion interferes with daily activities, it’s time to discuss surgical options to determine if surgery is best for you. A variety of surgical procedures are available to treat bunions. These procedures are designed to remove the “bump,” correct the changes in the bony structure of the foot and correct soft tissue changes that may also have occurred. The goal of surgery is to reduce and/or eliminate pain. If you are suffering from a “bump” to your big toe, please do not hesitate giving one of our offices a call for additional information or to schedule a consultation. It is 2014, the beginning of a New Year and new resolutions. If your resolution for the upcoming year is to get into shape, don’t forget to keep your feet in tip-top shape while following through with your resolutions to get fit. The American College of Foot and Ankle Surgeons offers the following tips for foot safety while at the gym. Start new workouts gradually— Increase your stamina and the length of your workouts gradually to avoid overuse injuries such as stress fractures or tendon strains and sprains. Stretching your muscles before and after workouts also helps prevent these types of injuries. Wear the right shoe and sock—Wear well-fitted athletic shoes designed for exercise or sport. Shoes that do not support the arch of the foot or provide cushion for the heel can cause heel pain (plantar fasciitis). Shoes that are too small can cause a neuroma, a thickening of the nerve tissue, in the foot, which may require injections, medication or physical therapy. Wearing cotton or non-slip socks are also key to help avoid painful blisters, which can become infected and cause more serious issues. Use good technique— Improper exercise techniques can result in injury to the tendons or ligaments in your feet and ankles. Incorrect posture or misuse of exercise equipment can cause decreased stabilization in the foot and ankle, leading to joint sprains and muscle strains. Protect yourself from bacteria—Sweaty shoes, public showers, exercise equipment and the pool deck at the gym are breeding grounds for fungus, viruses and bacteria, including drug-resistant strains like MRSA(methicillin-resistant Staphylococcus aureus) which has become increasingly more common. Therefore, never go barefoot while in public areas and cover cuts and cracks in the skin or ingrown toenails since these minor tears in the skin’s surface can act as an entry point for bacteria.